A low-noise accelerometer generates the electrical signal that most accurately represents the real signal without the need for signal processing. Noises are common in test and measurement applications. They are undesired signals that are generated by the combination of electrical and mechanical components of sensors and hardware devices. 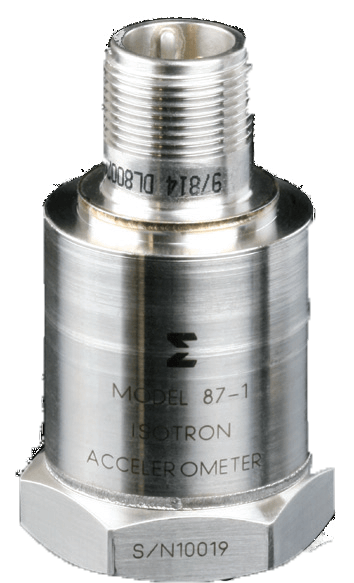 The noises present in acceleration measurement can be generated from the accelerometers, signal amplifiers or cables. At many applications, noise can be dealt with by using a signal conditioner to filter the unwanted data before transmitting the signals to the computer. However, it can present a major problem for seismic monitoring or other specific tests that are unable to tolerate noise. Manufacturers have designed a low-noise accelerometer to cater for such applications. As an example, Figure 2 below shows the relative noise spectra of various accelerometers from Meggitt-Endevco. 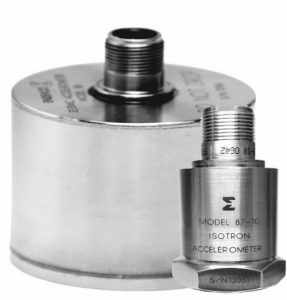 The model 86 and 87 are ultra-low-noise accelerometers from Meggitt that are used for seismic measurement while model 5220 is a common industrial accelerometer that is used for vibration and condition monitoring. Currently, it is impossible to design an accelerometer that “does-it-all”. There are engineering trade-offs that product developers should consider when designing a low-noise accelerometer. For example, the design of a subminiature accelerometer compensates its small size and mass against noises, sensitivity or high output. PSD=√(〖anm〗2+〖ane〗2 ), where anm2 = mechanical-thermal noise and ane2 = electrical-thermal noise. Mechanical-thermal noise is function of the mass and spring constant and the mechanical resistance of the sensor’s seismic system. It can be reduced by increasing the mass and quality factor (Q) or by decreasing the accelerometers’ resonance frequency. 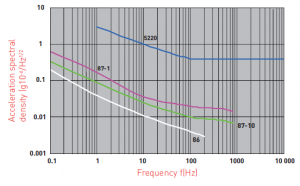 This defines the trade-offs between low-noise and compensated frequency response. It should be noted that mechanical-thermal noise is dominant over electrical-thermal noise at frequency response above 10kHz. Electrical-thermal noise is a noise contributed by internal or external electronics used in the measurement system. It is a function of the loss factors of the sensing materials. When selecting the materials for low-noise applications, one should select materials with few defects and impurities. These impurities may increase the capacitive charge of the material which increases the noise. Contradicting to mechanical-thermal noise, electrical-thermal noise is dominant at frequency response below 10kHz. Majority of low-noise accelerometers have internal electronics in their design to improve the signal-to-noise ratios. This configuration reduces the distance between the sensor and the charge amplifier which is a source of noise. It should be noted that the internal electronic itself is an additional source of noise which can be minimized by using a transistor. Selecting the suitable transistors for the job may be difficult due to the lack of noise specifications data from the semiconductor manufacturers. The sensor designers need to rely on their own experience to choose the best transistors components. Size is also another factor to consider when designing a low-noise accelerometer. Generally, a larger size accelerometer produces lower residual noise due to the larger crystal sensor assembly required to generate a higher output level. Subsequently, this design also reduces the accelerometer’s resonance frequency and lowers its frequency response. Figure 3 shows the size comparison of two ultra-low noise accelerometers from Meggitt-Endevco, 86 and 87. 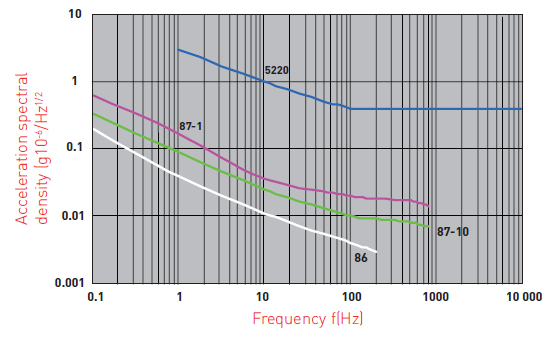 The larger size, series 86, generates lower residual noise compared to series 87, as shown in Figure 2 above. The series 86 also has lower frequency response than series 87; 0.01Hz and 0.05 Hz, respectively. Due to the advance in the material sciences, particularly in the single crystal technology, the crystals sensor in a piezoelectric accelerometer now generates a very low level of noise. When installed correctly, it may present negligible noise to the measuring chain of piezoelectric accelerometers. This system with higher charge sensitivity requires less gain within the electronic system and therefore, generate lower total system noise. Seismic monitoring typically requires both a wide dynamic range and an ultra-low noise accelerometer to detect low level, low frequency vibrations in the presence of larger signals. As an example, a seismic event with a displacement amplitude of ± 2.54cm will generate only 0.5mg of acceleration. Another example of seismic monitoring is monitoring low frequency vibration of structures and objects. The series 87 ultra-low noise accelerometers from Meggitt operates on a constant current mode and is ideal for this application. Rocket, missiles or ballistic testing falls into high-shock category with low levels of vibrations. The suitable solutions for this type of measurement would be a relatively insensitive accelerometer with a low noise floor, also defined as “accelerometer with a wide dynamic measuring range”. The device used is typically small and light-weighted. Depending on the requirements, the engineers may select between an IEPE or a charge-mode piezoelectric accelerometer. Some applications, such as medicals often generates very low-level signal that can only be accurately monitored using a low-noise sensor. Low noise sensor may be used to monitor any other applications that requires low-frequency and low-level events monitoring. In other case, low noise sensor may not be required for measuring a very high shock signal or a high level of vibrations, typically found in large rotating machinery. However, this is not to say that noise is of no importance to these types of applications. For full range of our accelerometer, please follow this link.